Courtesy of Kunal KakodkarCrowds at the NH7 festival 2011 in Pune, Maharashtra. Music festivalgoers in India are a happy lot these days. After spending the last decade looking enviously westward, and bemoaning the lack of Coachellas and Glastonburys at home, festival options now crowd India’s social calendars. Revelers can pick from travel-worthy destinations including a desert, an oceanfront, the ubiquitous Indian hill station and a handful of cities. For example, would you rather be: drunk on rice beer in Arunachal Pradesh’s beautiful paddy fields with the Radiohead-inspired singing of Sky Rabbit’s lead, Raxit Tewari, or wine-soaked in the vineyards of Nashik, fueled with copious amounts of live music from another Tewari – Ankur Tewari and the Ghalat Family? India’s music devotees are hopeful that the shoddy organization and short performer lineups that once characterized music “festivals” here are a thing of the past. “The term ‘music festival’ was often misused by Indian promoters,” said Arjun S. Ravi, a festival fixture and an acerbic music critic who runs the webzine Indiescision, which is sponsored by the music site NH7. Any event with “two or more artists on the bill, cheap drinks and a willing club” was billed a music a festival, he said. 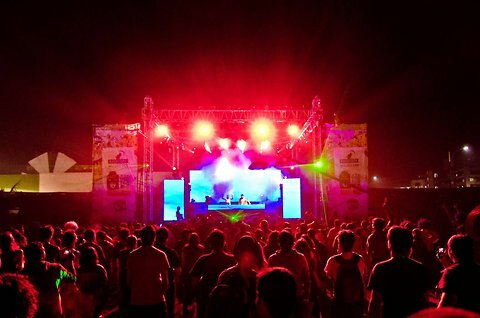 But in recent years, professional management groups have been putting together smoothly run, skillfully executed festivals, like Only Much Louder’s highly successful NH7 Weekender in Pune and Invasion in Delhi, Bangalore and Pune and Percept’s Sunburn, a three-day electronica festival, in Goa. Competition among these groups has meant more “long-term planning and better curators and audiences,” said Vijay Nair, Only Much Louder’s chief executive. “People now expect all the things that come together to make a music festival,” he said, including big lineups, multiple stages, film tents and food courts. The Indian music industry’s newest bedfellows, big corporate sponsors, have helped make these expectations possible. For years, big brands in India feted only Bollywood and cricket. Now they have “woken up to a large demographic of the youth that’s finding Bollywood crass,” said Ankur, the front-man and lyricist of the indie-rock band Ghalat Family. “The greatest boon to the music industry has been the ban on alcohol advertising,” said Anup Kutty, Menwhopause’s bass guitarist. Mr. Nair estimates that endorsements from alcohol sponsors account for about 60 to 70 percent of festival revenues. Finding a music festival to append to their name gives big brands much more mileage than any tie-ups with soda companies or releases of music compilations on compact discs. Mahesh Madhavan, president and chief executive of Bacardi South Asia, which is the chief sponsor of the Invasion and NH7 events, said the liquor brand has longstanding ties to music in India, dating from the 1990s, and has brought international bands like Bob Sinclar, Flo Rida and Basement Jaxx to the country. Bacardi paired an individual brand with each festival it sponsored: Dewar’s scotch with NH7 Weekender in Pune, which featured mattresses in the sun and slow, acoustic music, and Eristoff vodka at Invasion in Noida, Pune and Bangalore, which featured electronica, laser lights, the dance music group Prodigy and the D.J. David Guetta. Musicians like Mr. Kutty of Menwhopause say they have also found friendly governments as sponsors. He has enlisted the Arunachal Pradesh Department of Tourism for the Northeast’s first big mainstream music festival, Ziro. The founders of the Ragastan festival in Jaisalmer are partners with Incredible India, the central government’s tourism campaign. Still, a handful of festivals remain proudly independent, eschewing sponsors altogether, like Happily Unmarried’s Music in the Hills, which celebrate its eighth year this April. Happily Unmarried avoids sponsors to keep the festival small and focused. To help you decide where you want to wear your neons/Wellies/Ray-Bans and wave your lighters and jump around in mosh pits, we have listed the festivals of the season. Courtesy Ziro Festival of MusicZiro town in Lower Subansiri district, Arunachal Pradesh. Getting there: By bus or taxi from Itanagar, by rail from the North Lakhimpur Railway Station, or by air from Guwahati. Ziro will see local bands and big names from across the country come together for what’s being touted as the Northeast’s first music festival, in this green hill station. Expect performances from Digital Suicide, Dirty Punk, Vinly Records, Alisha Batth, Trisha Electric and Peter Cat Recording, among others. Partnered with NgunuZiro, which works for the sustainable development of Ziro valley and empowerment of local communities, the festival promises to respect local Apa-tani tribe ethics. Sponsors are the state tourism board and local businesses. Food stalls by Apa-tani tribe villagers will offer dishes like fermented bamboo, many kinds of meats and many more kegs of rice beer. Of the 2,000 expected attendees, most are likely to come from the northeast. With the dance music evangelist Nikhil Chinapa at the forefront, Sunburn kicked off in 2007 on Goa’s Candolim beach as a three-day festival, and since then the festival attracts over 100,000 people each year. This year, the festival has been on the move, first to Mumbai in April, and then Delhi and Colombo, Sri Lanka, in October. Previous Sunburn lineups have included big acts like Axwell, Above & Beyond, Gareth Emery, Markus Schulz, Pete Tong and Infected Mushroom. Expect magnificent pyrotechnics and trippy visuals of the Delhi audio-visual deejays BLOT, both in Noida and Goa. This year’s big names include Dutch deejay Afrojack and German EDM deejay Moguai, other than Indian heavyweights Jalebee Cartel’s Arjun Vagale and Ash Roy and DJ Pearl . Tickets: For Delhi tickets will cost between 1, 500 and 3, 000 rupees for Pune and Bangalore tickets still to be announced. Getting there: All three cities are well connected by air, road and rail. Now in its third year, the NH7 Weekender is expanding to Delhi and Bangalore despite skepticism by festivalgoers that the event can be successfully repeated outside of Pune. Delhi, in particular, has gained a reputation for mishandling big concerts by international artists like Bryan Adams, Akon and Metallica. But Mr. Nair of Only Much Louder said he believed that the best crowds will be in Delhi. The company has also promised that no acts will be repeated in the other cities. In Pune last year, more than 25,000 people visited five stages, featuring everything from punk, metal and electronic dance music to folk rock, dubstep and acoustic gigs. NH7 Weekender’s last act has usually been headliners like Imogen Heap and Asian Dub Foundation. This year one more stage, Fully Fantastic, has been added in homage to the great ol’ Daddy of Indian rock who passed away earlier this year, Amit Saigal. The lineup includes the Kaiserdisco, Solstice Coil, Parikrama. Shafqat Amanat Ali and the Music Basti Project. 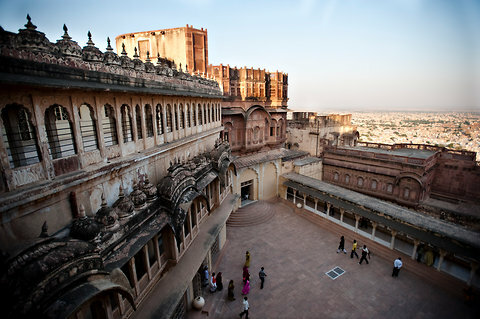 Keith Bedford for The New York TimesThe Mehrangarh Fort in Jodhpur, Rajasthan. Getting there: Regular flights, trains and buses to Jodhpur. High up in Mehrangarh Fort, this folk music festival brings bands from Egypt, Paris and San Francisco together with the most formidable names of Rajasthani folk music. The festival is made for those who love the idea of an innovative mélange of jugalbandi (literally “entwined twins”, an Indian classical music term for a duet) collaboration, under the backdrop of the year’s fullest, brightest moon. Where and when: Kanoi Village, Jaisalmer, Rajasthan, Nov. 16 to 18. Getting there:Regular flights, trains and buses are available to Jaisalmer. Harley bikers and buses of artists will head to the rolling sand dunes of Kanoi Village, where local Rajasthani folk musicians and experimental artists from all over the world will enthrall attendees against the awesome backdrop of Jaisalmer’s desert. The festival, attracting an estimated 5,000 to 6,000 people, features three stages, the Morio Main Stage, Ammara Electronic Stage (complete with visual performances with dancers and artists) and a World Stage (collaborations with different embassies include music from Iceland, Britain and Norway). Visitors will be able to stay in tents in the desert, go stargazing and enjoy a nighttime movie at the Ujalo film tent. Getting there: Regular flights, trains and buses are available to Pune. The Bollywood actor and nightclub owner Arjun Rampal and Shailendra Singh, an executive with the marketing giant Percept, have joined forces to create the Lost festival. The two are major players in the country’s music scene, having brought Lady Gaga to India’s first Formula One race in December and the Sunburn festival to Goa. Despite all that rhetoric, if Mr. Rampal’s and Mr. Singh’s track records are anything to go by, we’re sure Pune is in for another winning festival. Promising 50 artists over two days including 20 international artists, the Lost festival will move bag and baggage (installations, artwork, everything) from Delhi to Pune. Word from the organizers is that they’re hoping their very deep pockets might attract the likes of the Smashing Pumpkins, Jesse J or Porcupine.